is there a way to use to this on nvidia crads and make it work with the new nvidia drivers? CRU is not for adding FreeSync to non-FreeSync monitors, especially with NVIDIA. (01-16-2019 10:56 AM)maxchaos Wrote: Hi ToastyX thank you for your beautyfull app,I had used It for a while on my LG ultrawide monitor,today I was testing It for enlarge the freesync range,after putting the valute in the edit (45-75) i clicked apply and restart64,but the PC seems to freezer,but It work in background,and now It freeze everytime after booting normally Windows,in safe mode It start,I tried using reset,but It doesn't seem to work,in HDMI the monitor work perfectly,what di you suggest? Running reset-all.exe should remove all overrides. CRU does not change anything else. If there is no * next to the monitor name/status, then there is no override. (01-16-2019 07:11 PM)ToastyX Wrote: CRU is not for adding FreeSync to non-FreeSync monitors, especially with NVIDIA. But can be used to "activate" freesync in some korean panels in AMD. Or I'm wrong? If I read correctly, if you add hdmi block to a Qnix or Xstar panel you can get some of these monitors to work with FreeSync. Me question is, is possible to make a panel appear as a DP connector display like you can make it appear as a HDMI in the AMD method? To try to make adaptive sync work in these monitors? (01-16-2019 08:35 PM)Blackdragonbird Wrote: But can be used to "activate" freesync in some korean panels in AMD. Or I'm wrong? Yes, but NVIDIA does not support HDMI FreeSync, and AMD has issues like having to reconnect the monitor to trick the driver into recognizing it as HDMI. The QNIX/X-Star/Catleap monitors are a special case where the trick works because they don't have scalers, but most people are asking about monitors that definitely can't do it. (01-16-2019 08:35 PM)Blackdragonbird Wrote: Me question is, is possible to make a panel appear as a DP connector display like you can make it appear as a HDMI in the AMD method? To try to make adaptive sync work in these monitors? No. DVI and HDMI use the same signaling, so the HDMI data block is how the driver determines which it is. DisplayPort is completely different. Understood. Them nVidia has to allow adaptive sync over HDMI to allow us to try to activate it in these Korean panels. Yes indeed, 240Mhz limit. As of yesterday i didn't know what pixel clock meant, either way i managed to get to 1080p 103hz with original clocks and 105hz with custom timings confirmed no frame skipping. I couldn't find a timing combination that was stable at 106mhz. Is there is a methodology with the timings? I did several tests where i found min values for all 6 timings (back porch, front porch, sync, both H and V), but i couldn't use a combination of mins without problems. Is there is a methodology to this? I spend the whole day before calling it day to push to more than 105hz. The obvious thing however is that pesky 240mhz pixel clock limit which if removed it might be possible to push further these displays (assuming eDP is not maxed out at 240Mhz, is should be underspec since i'm already there). Too bad you haven't developed an intel pixel clock patcher I think more people would want one especially after all the info and guides i found over your tool in laptop forums mainly here ( http://forum.notebookreview.com/threads/...us.802167/ ). Virtually all laptops at the moment (since i-2nd gen are running an intel cpu with integrated graphics and i am not happy to say it as an amd guy), similar to all people with a 7700k and the like (although desktop users usually run discrete graphics on desktop that outputs directly to the monitor). I still don't have my own desktop and use this workstation laptop i borrow from work but i can do some testing if needed. The only other thing that remains is that for some reason any resolution over 60hz reports 6-bit colour depth instead of 8-bit but that was a bug in the intel driver so it must be still present (i will write them about this). (01-17-2019 07:34 AM)TnF Wrote: Yes indeed, 240Mhz limit. As of yesterday i didn't know what pixel clock meant, either way i managed to get to 1080p 103hz with original clocks and 105hz with custom timings confirmed no frame skipping. I couldn't find a timing combination that was stable at 106mhz. Is there is a methodology with the timings? I did several tests where i found min values for all 6 timings (back porch, front porch, sync, both H and V), but i couldn't use a combination of mins without problems. Is there is a methodology to this? With laptop panels, the minimum is usually limited by the blanking, which is front porch + sync width + back porch. The individual values don't matter as much. (01-17-2019 07:34 AM)TnF Wrote: I spend the whole day before calling it day to push to more than 105hz. The obvious thing however is that pesky 240mhz pixel clock limit which if removed it might be possible to push further these displays (assuming eDP is not maxed out at 240Mhz, is should be underspec since i'm already there). A patcher wouldn't make a difference. The patchers are for external monitors and have no effect on DisplayPort limits. That default color space doesn't match DCI-p3 and doesn't match real color space of my TV. SO red color doesn't look saturated as intended because 0.659180,0.339844 is worse than 0.68, 0.32. 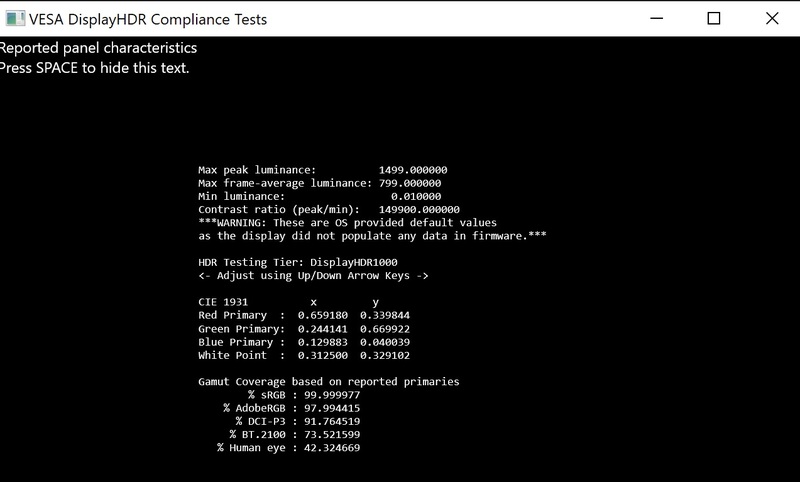 Is there any way to everwrite these values for windows HDR(can be checked by VESA test program)?